The Unrepresented Nations and Peoples Organization (UNPO) will be convening a conference entitled ‘Land of Forsaken Voices: The Geo­politics of Justice, Impunity and Human Rights in Balochistan’. The event will draw attention to the deteriorating human rights and security situation in Balochistan, as well as to the geopolitical complexities which inform these developments. 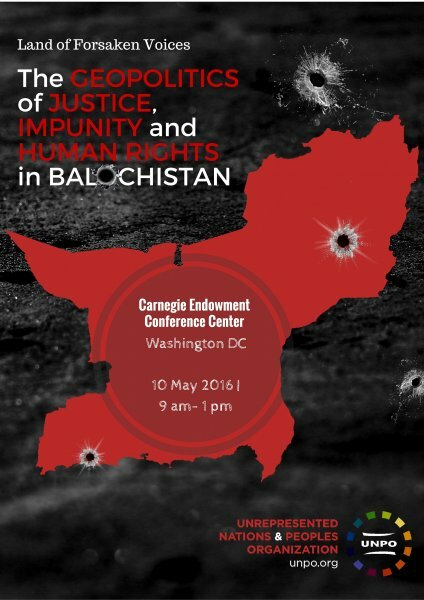 The event will take place at the Carnegie Endowment Conference Center, Washington DC, on 10 May 2016 from 9am to 1pm. Gross human rights violations, such as torture, enforced disappearances and extrajudicial killings are still the order of the day in Pakistan’s westernmost province, Balochistan. Despite local human rights defenders’ struggle to address these systematic abuses, Islamabad uses intimidation tactics to silence anyone who dares bringing these heinous crimes to light. Meanwhile, Pakistan’s partners in the West pay mere lip service to changing the horrendous status quo. Their half-hearted approach oscillates between public allegiance to international human rights norms and realpolitik based on considerations of power and economic interests. However, even if the systematic abuse of power by Pakistan’s security forces against the Baloch people were to stop immediately, this would still leave unaddressed the question of justice – the gigantic task of addressing the legacy of decades of widespread human rights abuses in order to facilitate a peaceful transition to a democratic society, where fundamental rights are fostered and protected. Against this background, the conference will provide a survey of the non-adherence to human rights norms in Balochistan, offering insights into the geopolitical factors under¬lying this ongoing tragedy and discussing ways forward, i.e. the question of how justice and reconciliation can contribute to sustainable peace, stability and development in Balochistan. The event will bring together expertise from academics, politicians, civil society, practitioners and Baloch representatives, and will be also open to the press. To register for the event please fill in this form.